Green Lagoon Park is a private resort with a swimming pool and various relaxing environment. 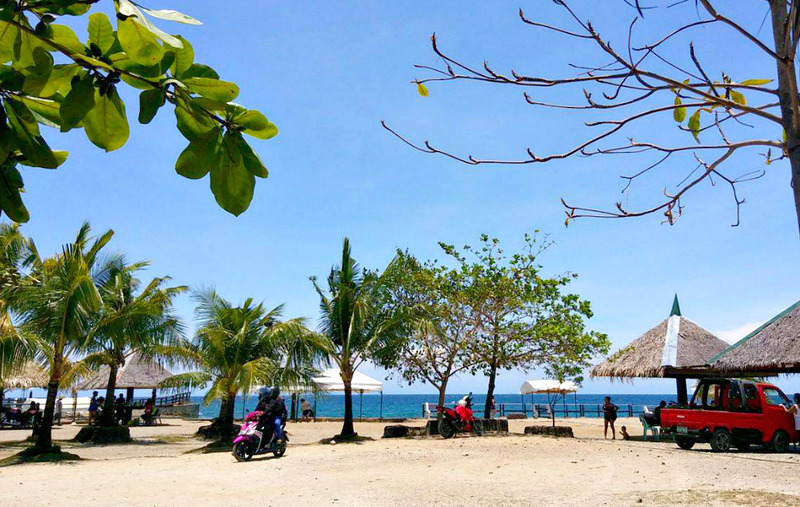 This property is conveniently located in Canamucan, Compostela, Cebu Province. It offers various facilities that cater to the needs of small and bigger groups. 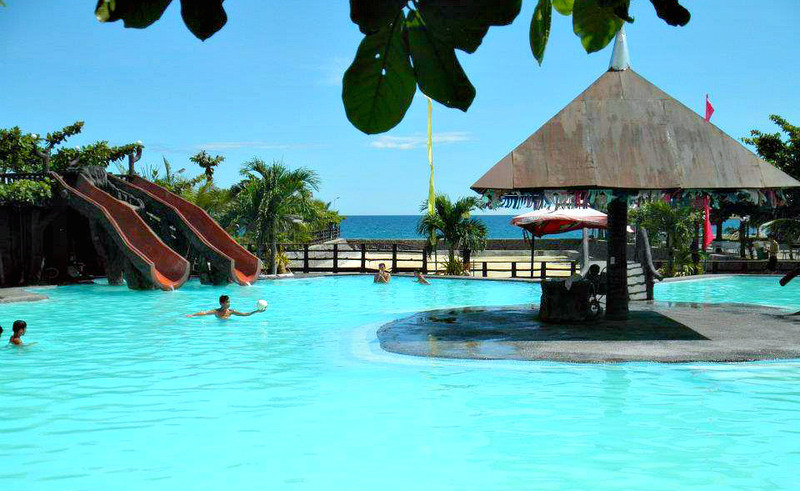 Green Lagoon Park is located around an hour from Cebu City, the capital city, by private vehicles or public transports. 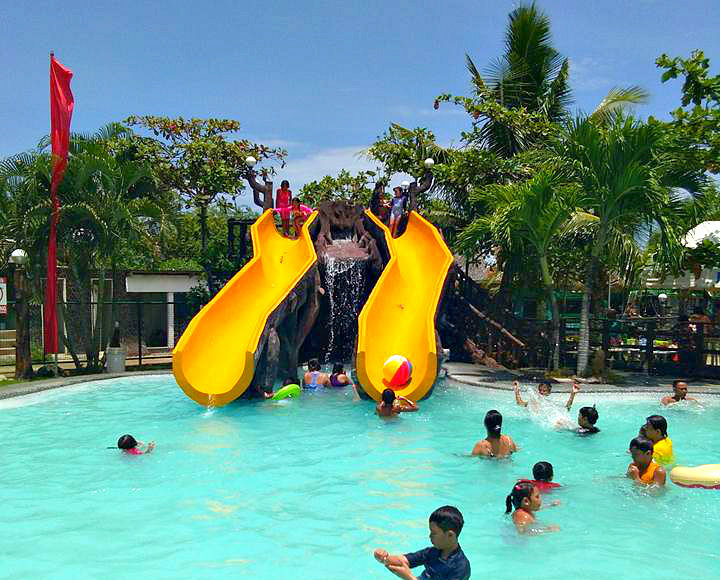 Children would surely enjoy the swimming with two slides, which is available from early morning until late – around 10 pm. The property’s facilities prove that it is convenient and friendly to family guests with children as well as adult groups. What is more is that the resort is fortunately located by the seaside. It means that you get both advantages – fresh sea breeze and spacious resort. However, resort guests seem to be enjoying more the swimming pool than the beach itself. For those who stay until late in the afternoon can experience the spectacular sunset. Selfies and groupies, by the way, is usually done with the sea as their background view – fantastic! This pool is wide and has two water slides which are very entertaining mostly by children. But, of course, many adults also do! In the middle of the pool, you can find a shade structure built on top of an ‘island’ which is connected with two overarching bridges. You can swim through or under that bridge. By the poolsides, you can find shades and huge parasols where you can freely take cover from direct sunlight and enjoy your snacks and other day’s provisions. Your children, or even adults, can run around the spacious resort and can play all sorts of games they want to play. You can engage in any active games such as volleyball, badminton, and anything allowed by the management. Please ensure that you can use your sports (or games) equipment/tools by inquiring in advance. These are the pyramid-shaped shades close to the beach where guests can enjoy their food, drinks, chats, rests, or anything. From these shades, you can enjoy watching or observing the vast ocean and the blue skies (if sunny!). Banana Boats, Boating, Island Hopping, etc. A mother and child chilling up at Green Lagoon Park's swimming pool! That’s right! Green Lagoon Park has a small clinic and an ambulance too in case of accidents or any emergencies that need a prompt medical response. However, please, take care of yourself while having. Also, please watch your little ones! This is where you can purchase not only foodstuff but also souvenirs for your friends or family members. Products are the usual locally-made stuff with some marks about the resort, among other stuff to remind you about the place. Wow, this is fantastic! If you are quick enough, you can order and have your pizza. That’s because everybody is buying it and he or she could run out of supply quickly. You can have some formal event that you can do in this resort: meetings, business gathering, or any, and then enjoy the beach and other facilities after your business. You don’t need to bring with you everything that you want to eat from outside since Green Lagoon has its bakery. They sell some choices of bread, cakes, and some pastries you can enjoy with. This is a great place to enjoy a beach volleyball although you won’t see ( I guess) women playing this one here! Most beach volleyball game is being played by men in the Philippines, unlike the popular beach volleyball in other countries. Of course, the resort has a spacious parking area for your private vehicle. Parking Space & Cool Cottages! Swimming Pool: Php 100 from 8 AM to 5 PM; PHP 120 from 5 PM to 10 PM for adults. For children, only PHP 50 and PHP 70 similar to the schedule mentioned for adult users. Feel the thrill at Green Lagoon's water slides... Cool! Nipa is a variety of palm that grows in swampy areas or near bodies of water. The leaves are then aligned together using a bamboo stick and rattan rope to keep them firm. Then they are arranged in a way forming as roofs for such structures. This roof is cool despite the blistering heat of summer! Air-conditioned Room for an overnight stay is available for a rate ranging from PHP1,000 and above. Cottage rent is Php500. These huts are built close to the beach. From Mandaue City, you can take a Jeepney ride for the resort. Please let the driver know you are getting off in that resort. Alternately, take a bus from Cebu North Bus Terminal. It takes about an hour to get there – depending on the time and traffic situation. The following attractions are only a few we can list. But if you have more, I would be glad to hear your recommendations. If there are resorts and attractions in Compostela that are not on the list above, please let me know. Thanks. We wish dearly you’ll come by again or more often in the future to check more of Cebu’s vacation or travel resources. Please, share or like this page if this is useful!